CDX2 is a homeobox gene that plays a critical role in the development of the intestines. It has now firmly established itself as a marker of intestinal carcinoma when dealing with a clinical situation of metastatic adenocarcinoma of unknown origin. We, herein, report a case with a unique clinical history where CDX2 positivity is seen in metastatic endometrial adenocarcinoma to the lung, thus drawing our attention to a diagnostic pitfall. A 59 yearold lady, diagnosed case of FIGO grade I endometrial adenocarcinoma, underwent left nephrectomy for metastasis, after nearly 4 years and was then referred to our hospital. About 2 years prior to nephrectomy, she had had pelvic recurrence for which radiotherapy was given. Positron emission tomography (PET) scan showed active disease in left lower lung and metastasis in right lung. She took five cycles of chemotherapy (Paclitaxel, Carboplatin) and showed good clinical and radiological response. After 1.5 years of follow-up, the lung tumor showed exaggeration and she took further four cycles of chemotherapy (Gemcitabine, Carboplatin). Subsequent bronchoscopic biopsy was taken and is currently described. 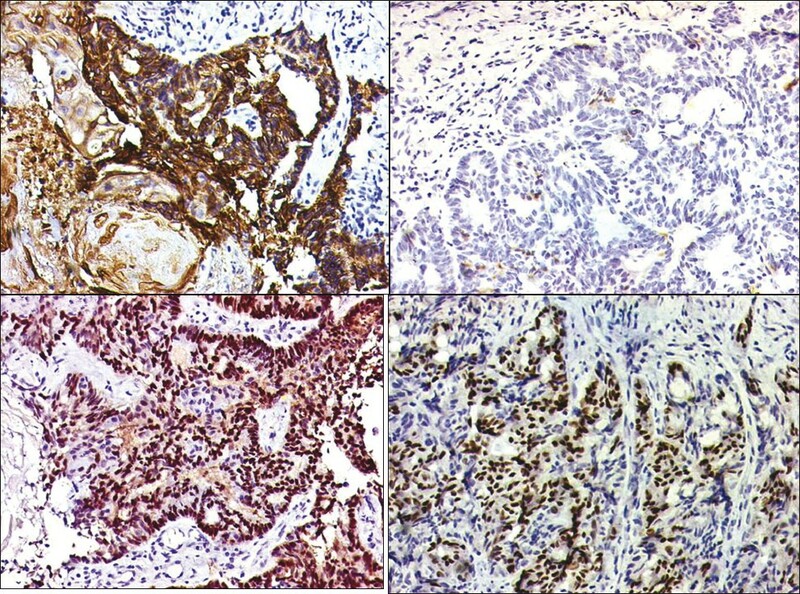 On histology, it showed endometrioid adenocarcinoma with squamous differentiation [Figure 1]a-c. On IHC, the tumor cells were positive for CK7, ER [[Figure 2]a and c respectively] and were negative for CK20 [Figure 2]b, TTF1, CD 10 and WT1. Staining for β-catenin was equivocal. Focal positive staining for CDX2 was also seen [Figure 2]d. However, despite this finding, based on morphology, CK20 negativity and CK 7 positive staining, a diagnosis of metastatic endometrioid adenocarcinoma to the lung was made. She has been prescribed further chemotherapy. Our interest in reviewing CDX2 staining in tumors stems from positive finding in this metastatic endometrioid adenocarcinoma. It is described, although uncommonly, and that to, in tissue microarray (TMA) studies. Delott et al. describe 5.9% positivity in endometrioid adenocarcinoma of the endometrium when they studied TMA bases 629 tumors from various sites. Moskaluk et al. also describe extensive nuclear CDX2 positivity in 1 out of 23 endometrioid adenocarcinoma cases of the endometrium (4.3%). Incidentally, normal proliferative and secretary endometrium showed CDX2 positivity. In a comprehensive study, Wani et al. showed CDX2 positivity in 43.6% endometrioid adenocarcinomas and have observed that positivity is significantly higher when squamous differentiation is prominent, which was seen in our case. β-catenin expression also parallels in these tumors and it is possible that CDX2 expression is dependent on β-catenin accumulation in the nuclei. Similarly, Hougton et al. observed CDX2 positivity in squamous morules postulating that these areas represent early squamous differentiation. CDX2 positivity in a metastatic endometrioid adenocarcinoma has not been described. The current case is informative in that it shows a diagnostic pitfall. In a small sample when squamous differentiation is not apparent, CDX2 positivity should not be solely relied upon to diagnose intestinal malignancy. Background history, morphology, coupled with CK7 positivity and negative staining for CK20 lead us in this case to the correct diagnosis. This finding is also relevant in considering differential diagnosis of a lung tumor mass. 1. Winn B, Tavares R, Fanion J, Noble L, Gao J, Sabo E, et al. Differentiating the undifferentiated: Immunohistochemical profile of medullary carcinoma of the colon with an emphasis on intestinal differentiation. Hum Pathol 2009;40:398404. 2. De Lott LB, Morrison C, Suster S, Cohn DE, Frankel W. CDX2 is a useful marker of intestinal-type differentiation. A tissue microarray based study of 629 tumors from various sites. Arch Pathol Lab Med 2005;129:11005. 3. Rossi G, Murer B, Cavazza A, Losi L, Natali P, Marchioni A, et al. Primary mucinous (so called colloid)) carcinomas of the lung: A clinicopathologic and immunohistochemical study with special reference to CDX2 homeobox gene and MUC2 expression. Am J Surg Pathol 2004;28:44252. 4. Moskaluk CA, Zhang H, Powell SM, Cerilli LA, Hampton GM, Frierson HF Jr. CDX2 protein expression in normal and malignant human tissues: An immunohistochemical survey using tissue microarray. Mod Pathol 2003;16:913-9. 5. Wani Y, Notohara K, Saegusa M, Tsukayama C. Abberant CDx2 expression in endometrial lesions with squamous differentiation: Important role of Cdx2 in squamous morula formation. Hum Pathol 2008;9:1072-9. 6. Houghton O, Connolly LE, McCluggage WG. Morules in endometrioid proliferations of the uterus and ovary consistently express the intestinal transcription factor CDX2. Histopathology 2008,53:156-65.